L 4 1/4″ (11 cm). Harsh “ji-dit.” Song begins with several high, thin notes followed by loud, whistled phrases. Description: Tiny and plump. 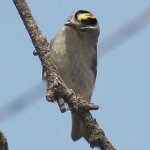 Grayish-olive above; dusky below; incomplete white eye-ring; short, slightly forked tail; and two white wing bars. Male’s red crown patch is seldom visible; crown patch lacking in female. Lacks striped crown. Behavior: Active and nervous; flicks wings rapidly when calling. Habitat: Found in a wide variety of forested and shrubby habitats, including parks and gardens. Occurs in both deciduous and coniferous vegetation, showing no particular preference for either one. Food: Characteristically hovers above a twig looking for caterpillars, aphids, and other insects. Where in Nebraska: Common to uncommon spring and fall migrant, and rare and local winter resident across the state. 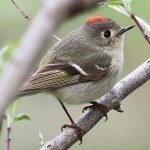 Field Notes: Because kinglets are so small, they can feed on the tips of conifer branches. 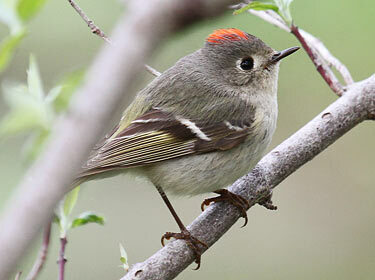 Fun Facts: The latin name for the Ruby-crowned Kinglet is “little king”.